Sconfitta nella seconda amichevole ad Aukland contro l’Australia. Il risultato finale è di 2-1 per le “Matildas”. 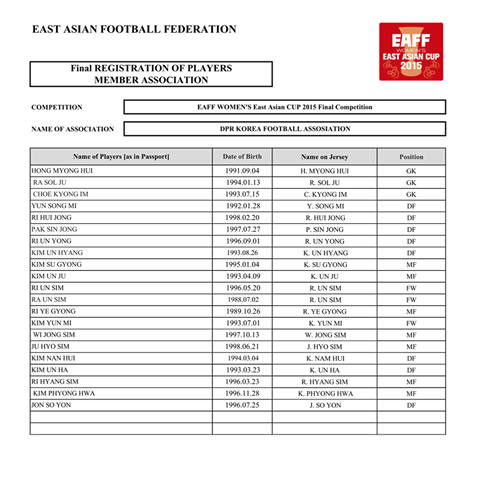 Posted in Senza categoria and tagged nazionale femminile on febbraio 10, 2015 by calciocorea. Pareggio per 1-1 per la nazionale femminile della RPDC nella prima gara contro la Nuova Zelanda. In rete Wi Jong Sim. 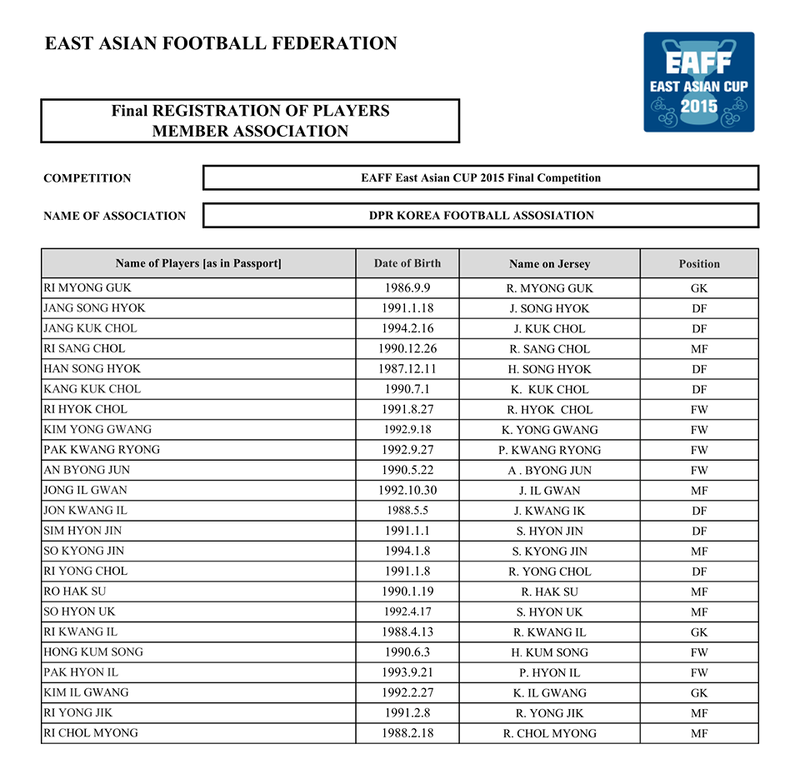 Posted in Senza categoria and tagged nazionale femminile on febbraio 8, 2015 by calciocorea. La nazionale femminile giocherà un triangolare ad Aukland, contro Australia e Nuova Zelanda. Posted in Senza categoria and tagged nazionale femminile on febbraio 7, 2015 by calciocorea. Giochi Asiatici femminili: LA RPDC E’ MEDAGLIA D’ORO! Grazie alla vittoria per 3-1 la nazionale femminile della RPDC vince la medaglia d’oro ai Giochi Asiatici di Incheon. 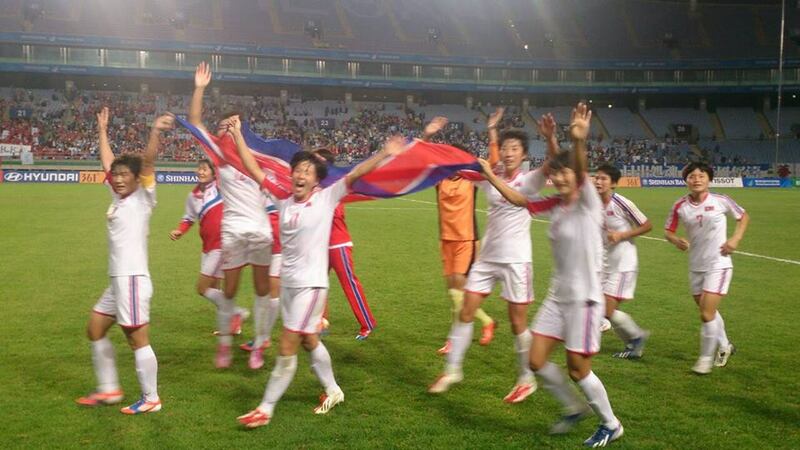 Posted in Senza categoria and tagged nazionale femminile, giochi asiatici on ottobre 1, 2014 by calciocorea. Incheon: Defending champions Japan are through to the final at the 17th Asian Games after claiming a 3-0 win over Vietnam in Monday’s semi-finals. In a game they dominated at the Incheon Football Stadium, the Japanese took the lead after 25 minutes when Mizuho Sakaguchi pounced on a loose ball and sent an emphatic finish into the back of the net, after Dang Thi Kieu Trinh could only punch Aya Miyama’s cross into her path. Despite creating plenty of chances, they were however unable to add to their lead largely owing to some poor finishing, as well as a nervy but effective display from opposition keeper Dang. Still, they did make it 2-0 eight minutes into the second half when Kana Kitahara did well to keep things alive after an earlier shot has smashed off the bar; hooking the ball back into the danger zone for Kita Osafune to emphatically head home. And in the 74th minute, the result was put beyond doubt as Yuka Sugasawa made a darting run to the near post to escape her opponent before meeting another dangerous delivery from Miyama with a deft header past Dang for her side’s third. With the win, Japan are through to the final for the second tournament running and it will be a repeat of the 2010 final after DPR Korea also advanced with a 2-1 triumph over neighbours Korea Republic. It was the South Koreans that drew first blood at the Incheon Munhak Stadium in the 12th minute when Jung Seol-bin lined up a 25-yard freekick and unleashed a powerful effort, which dipped awkwardly just before the goal-line and squirmed in under Hong Myong-hui’s despairing dive. But six minutes after the half-hour mark, DPR Korea pulled level after they cleverly carved out an opening; Ri Ye-gyong meeting a low cross from the right with a deft touch to steer the ball into the far corner. With both sides failing to find a second goal in the second period, it looked like extra-time – and perhaps penalties – would be on the cards. Nonetheless, in the third minute of injury-time, a poor back-header by Korea Republic’s Lim Seon-joo played Ra Un-sim through and although her initial effort was saved by Kim Jung-mi, substitute Ho Un-byol was on hand to slot home the rebound and win it for the North Koreans. The final between Japan and DPR Korea will be held at the Incheon Munhak Stadium on Wednesday evening, while the bronze medal match between Korea Republic and Vietnam will also be played earlier that day. 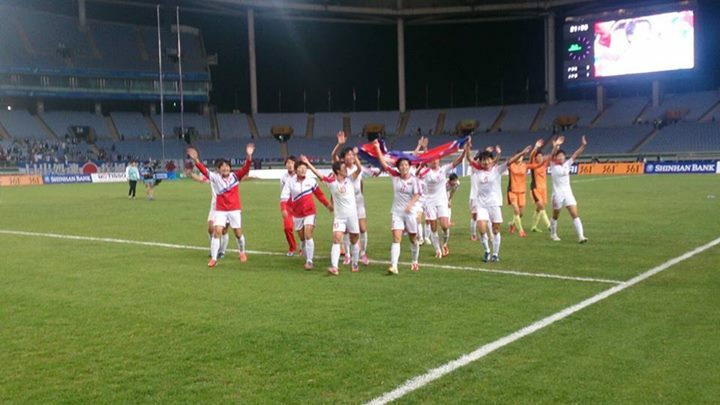 Pyongyang, September 30 (KCNA) — The DPRK women’s football team beat south Korean rival 2:1 in the semi-finals on Sept. 29 to advance into the finals at the 17th Asian Games. This news is delighting all the people in the country. “Their success gives great strength and courage to me and all other workers at the mill. 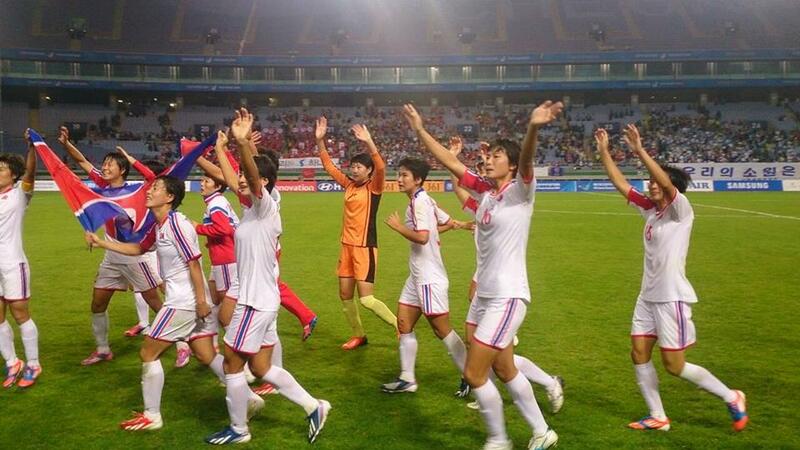 Pyongyang, September 30 (KCNA) — Prof. and Dr. Ri Tong Gyu, a football expert of the DPRK, expressed belief that its women’s football team would emerge winner at the ongoing 17th Asian Games. Experts of various countries have spotted the DPRK women’s football team as a hopeful at the current Asiad before its start. Such view is quite reasonable, because the DPRK team took the titles at the 2013 East Asian Cup and the 6th East Asian Games and involves such talented players as Ra Un Sim, Kim Un Ju and Ho Un Byol. The team scored 11 goals in group league and quarterfinals without losing even one point. Its finals with the Japanese team to be held on Oct. 1 will be expected to be very keen. The two teams had competed with each other in the finals at the 15th Asian Games, eight years ago. At that time the DPRK team beat its Japanese rival 4:2, emerging two-time winner in the wake of the 14th Asian Games. I am sure that the DPRK team will win at the current games when it displays its strong stubbornness and collectivism and sustains its tactics properly as it has done in the previous matches.